In a defining clause, use that. In non-defining clauses, use which. Remember, which is as disposable as a sandwich bag. If you can remove the clause without destroying the meaning of the sentence, the clause is nonessential and you can use which. People use which and that every day. Just because these words are common doesn’t mean they’re easy to use. In particular, clauses cause a lot of confusion, but there’s an easy way to remember which one to choose. Which vs. That: What’s the Difference in Usage? My bike that has a broken seat is in the garage. In this sentence, you understand that the speaker has at least one other bike. Specifically, the bike he’s talking about is distinguished from his other bikes by its broken seat. If you removed the clause “that has a broken seat,” you would lose the implication that he owns more than one bicycle, and even if you somehow knew about the other bikes, you wouldn’t know which one was in the garage. Which introduces non-defining clauses. Unlike defining clauses, non-defining clauses (also called nonessential or nonrestrictive clauses) don’t limit the meaning of the sentence. You might lose interesting details if you remove them, but the meaning of the sentence wouldn’t change. Sometimes, these phrases are set off by commas. My bike, which has a broken seat, is in the garage. Here, the broken seat is simply a description of the bike in the garage. There’s no implication that the speaker owns more than one bike. Do you see the difference? 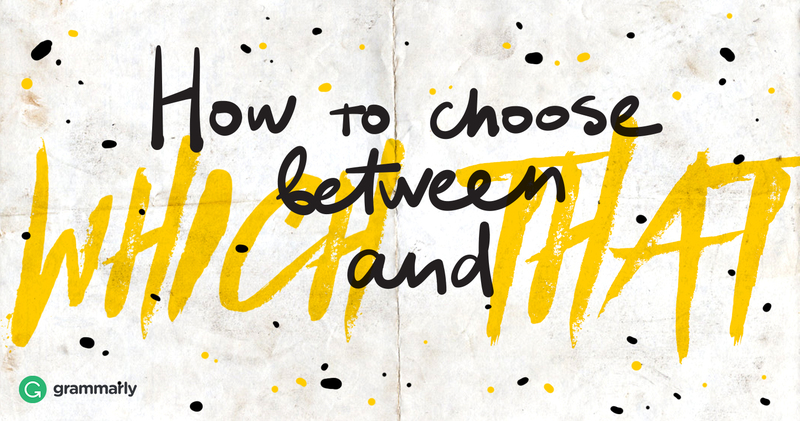 Perhaps a little mnemonic device will help you to remember how to choose between that or which. Because non-defining clauses add removable information, it’s easy to remember to use which if you think of a plastic sandwich bag. They are disposable, and so are clauses with which. Let’s look at some examples from real life. Twenty years from now you will be more disappointed by the things that you didn’t do than by the ones you did do. . . . Sail away from the safe harbor. Catch the trade winds in your sails. Explore. Dream. Discover. Which and that are common words, but they are important. By identifying your clauses as defining or non-defining, you can easily remember when to use which and when to use that. If you are ready to learn more, study up on defining and non-defining clauses.